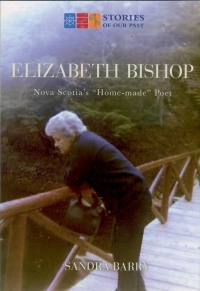 CM Magazine: Elizabeth Bishop: Nova Scotia's "Home-made" Poet. (Stories of Our Past). Elizabeth Bishop: Nova Scotia's "Home-made" Poet. (Stories of Our Past). Grades 7 and up / Ages 12 and up. After a rocky first year-at one point she and a friend ran away-Elizabeth settled down, immersed herself in her studies, and gradually established her own little society of like-minded friends. She first concentrated on music, but because public performance, which frightened her, was required, she abandoned it for literature. She was also fascinated by science, and thought about becoming a doctor-an idea she carried into the 1940s when, discouraged by her lack of literary progress, she considered abandoning writing entirely for medicine. By her junior year she was immersed in the literary realm and had made a reputation for herself as an intellectual. One of her English teachers knew early on that Elizabeth was "doomed to be a poet" and that she was entirely capable of attending to her own education. Elizabeth Bishop's strong ties to all three of the United States, Canada, and Brazil, asserts Sandra Barry, positions her as "one of the few truly Pan-American poets of the twentieth century" (p. 105). Yet it is the extent to which Bishop's early childhood experiences in Nova Scotia shaped her writing that most interests the author and the publisher as they claim Bishop's legacy for Atlantic Canada. Barry's Elizabeth Bishop: Nova Scotia's "Home-made" Poet joins Molly Kool: Captain of the Atlantic, Rum-Running, and Bluenose in Nimbus Publishing's "Stories of Our Past," a series of biography and history for readers age 12 and up. Like its predecessor, Molly Kool, Elizabeth Bishop is an aesthetically pleasing object. There's a polished sturdiness to its cover and pages and a generosity to the variety and number of graphics. The 81 images distributed throughout the text include the expected and the unexpected: examples of the former include photographs of Bishop, of her family members and friends, of places she lived, and of works published by and about her, while reproductions of a tinsmith's advertisement, a bus schedule, and a handmade Christmas card supply examples of the unexpected. All images benefit from either captions or shaded sidebars; in fact, of the book's 31 sidebars, 11 relate directly to photographs. The other 20 provide glosses on events, places, or concepts mentioned in the text proper, such as "Halifax Explosion" (p. 29), "Vassar College" (p. 64), and "Poet Laureate" (p. 105). Here again, as in Molly Kool, all pages except those that begin chapters contain running footers with two-colour images: on the left-hand side is a compass; on the right is an image of Bishop clasping a hat to her head. In total, the footer undergoes 11 colour changes. The intensity of the visual experience in this book is particularly fitting, since Barry reveals that Bishop, herself, painted (p. 82), took a special "interest in presentation (in fonts, paper, cover art, and design)," and "[m]ore than once...said she would rather have been a painter" (p. 99). As for the verbal component, in the prologue, Barry pictures Bishop at the age of 41, sitting at her desk in her estudio, writing the short story that becomes "In the Village." Beginning the biography in media "res" at that moment offers an ideal entry point into Bishop's life since it situates the reader at the Pan-American juncture: the American-born poet living in Brazil and writing a memoir of her Nova Scotian childhood. This tactic also accords with the author's fluid writing style, evident here and in the subsequent eight chapters and epilogue. Barry adeptly pilots her readers, sometimes backward, sometimes forward, along the narrative trajectory of the poet's personal and professional development. To all the foregoing add the bibliography, sources, and index, and it is difficult to think of any other features one could include to make this biography more well-rounded. The book's first half delineates Bishop's ancestry, infancy, childhood, and adolescence, while the last half charts out Bishop's adulthood through her preparatory college education, her evolving career, and her emerging sexuality. In the first few chapters, Barry describes a chain of events in the poet's early years that irrevocably shape the course of Bishop's life: the death of her father when she was eight-months-old, her mother's rapidly deteriorating mental health and her being institutionalized soon thereafter, and her paternal grandparents' subsequent removal of her from her maternal grandparents' home in Great Village, Nova Scotia, to Worcester, Massachusetts. Although Bishop spent a mere two-and-a-half years in Great Village, these dislocating experiences undeniably informed her poetics and aesthetics, according to Barry. The time in Great Village instilled in Bishop a desire to "explore...the mysteries and contradictions of home and travel, love and loss, life and death" (p. 59). It also impressed upon her the importance of community Even though Bishop as an adult coped with alcoholism, physical illnesses, and deep grief over the deaths of friends and family members, she maintained a close community of supportive friends and fellow artists. Furthermore, Barry remarks, Bishop not only had an impact on her contemporaries, but also, through teaching appointments and awards, on future generations of writers and academics. All throughout the book, Barry introduces excerpts from Bishop's poems and archival images. The result is an absorbing biography, immersed in detail. The tone of Elizabeth Bishop is more elevated and academic than that of Molly Kool. Whereas an excerpt from Molly Kool returned a Flesch-Kincaid Grade Level of 6.9, the excerpt above scores an 11.7. Yet in contrast to the generally high quality of the writing, there are impishly many specters haunting the text. Most of them lurk as sentence fragments beginning with "but" (p. 61, 70, 81, 87, 88, 100) although a few dangling modifiers materialize as well (p. 37, 40, 54). Also visible are heedless ghoulies like a severed month and day-Bishop's birthdate, displayed as "February / 8, 1911" (p. 21); an improperly cleaved "poi-gnant" instead of "poign-ant" (p. 22); and the excision of a "t" from the word "the" in a quotation (p. 62). An editorial exorcism may be necessary before Nimbus releases the next title in the series. Some critics might call it reaching to claim Bishop as a Canadian poet, but Barry makes a strong argument for it by directing attention to the significant proportion of Bishop's work that recalls her Great Village childhood (p. 45). Furthermore, Barry has the credentials to back her argument: a poet herself, the author also happens to be co-founder and past president of The Elizabeth Bishop Society of Nova Scotia. Moreover, she has contributed to the development of the Elizabeth Bishop archives held by Acadia University (p. 107). Barry's thorough knowledge and respectful treatment of her subject make this compact (21 cm x 14 cm) and comprehensive biography a valuable addition to school and public libraries' collections. Julie Chychota lives and works in Ottawa, ON, facilitating communication for persons with hearing disabilities by capturing speech as text on her trusty MacBook. NEXT REVIEW | TABLE OF CONTENTS FOR THIS ISSUE - December 2, 2011.